Today’s thrift store decor challenge started with one of the nicest jewelry cabinets I’ve found at a thrift store in a long time. I almost didn’t paint it. But you know me… I have to paint everything! 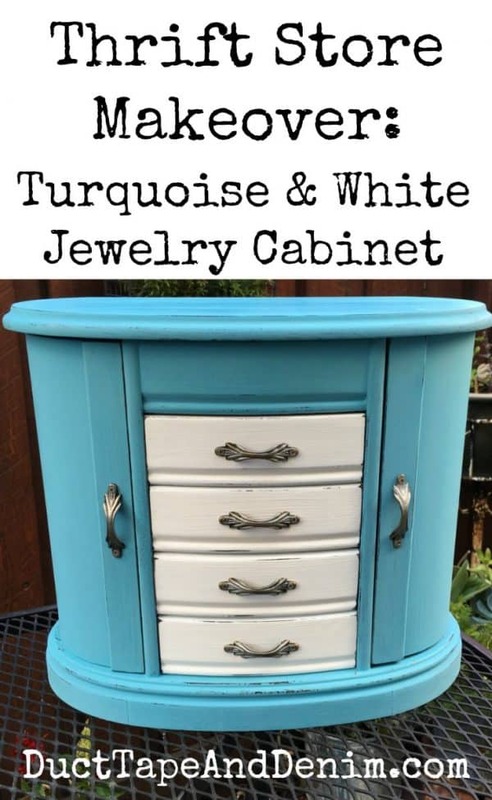 Plus I had some turquoise paint leftover from a previous project so this became a turquoise and white jewelry cabinet makeover. Here’s what I started with on that painting day. The middle cabinet was there for inspiration. 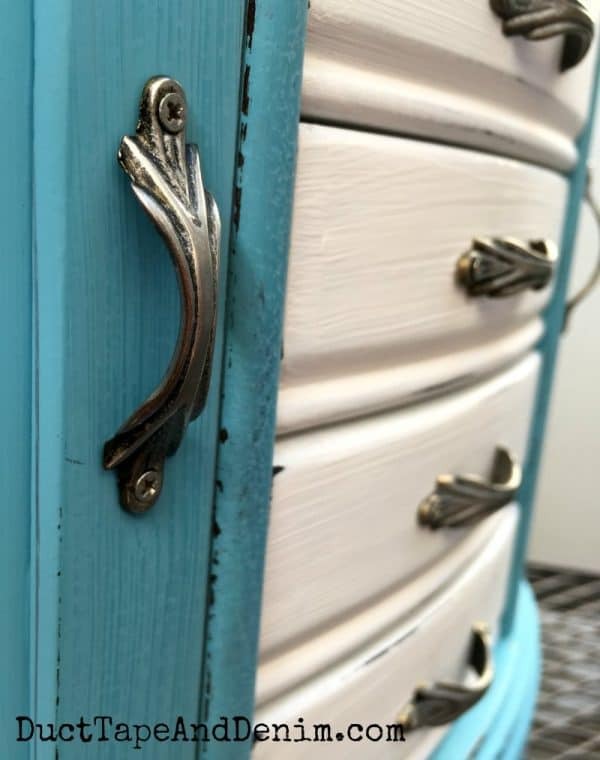 I loved how the white drawers looked with the turquoise and wanted to try it again on this one. 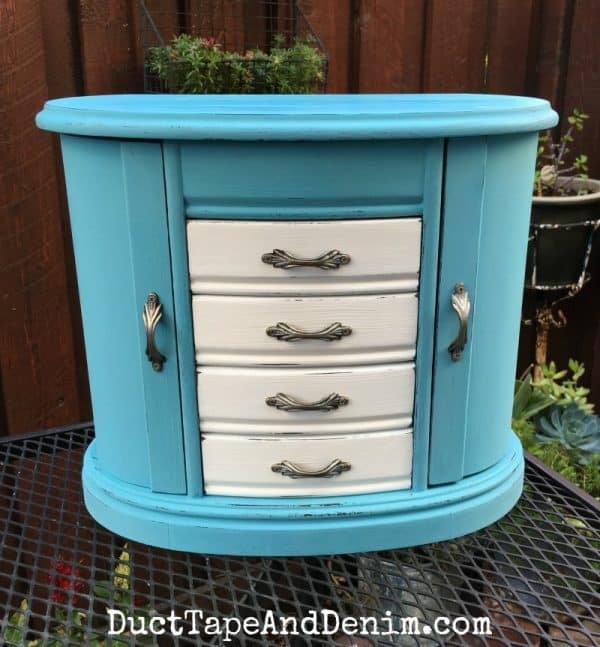 After removing the handles, I gave the drawers two coats of white and the body one good coat of turquoise. When that was completely dry I screwed the handles back on and it’s ready to go! Love the paper you added to the sides of the drawers. I alway like little details like that. Really pretty color choices. 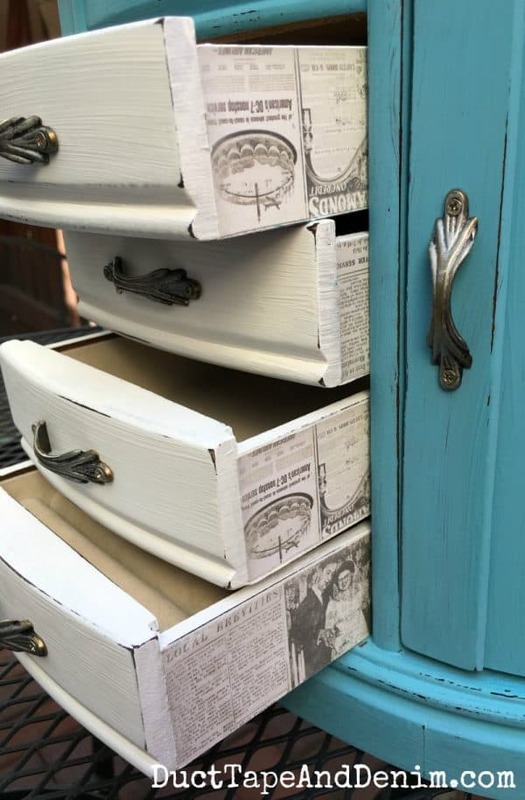 Love the addition of the paper to the sides of the drawers. That is a nice touch. Oooooh that is adorable!!!!! The paper on the sides is awesome! That is a nice jewelry box to score at a thrift store. The ones I see are always so beat up. Love the color! This is SUPER cute! I love the blue paint you added. I’ll definitely be on the lookout for a jewelry box to upcycle soon. Very pretty makeover, I love the addition of the scrapbook paper on the drawers . I would love to have this sitting on my dresser! I love what you did with the drawers. That is so much prettier in Turquoise…but what isn’t? LOL! 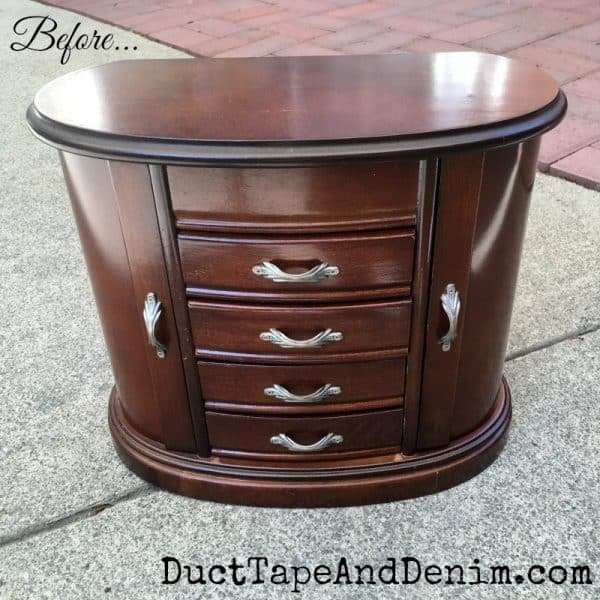 Beautiful Jewelry Box transformation! I love the color! Nice job! Wow! Very pretty. I love all the details. This is too cool. I love the color. So much better and you got got $30 for it that’s great! Oh WOW! What a great find. 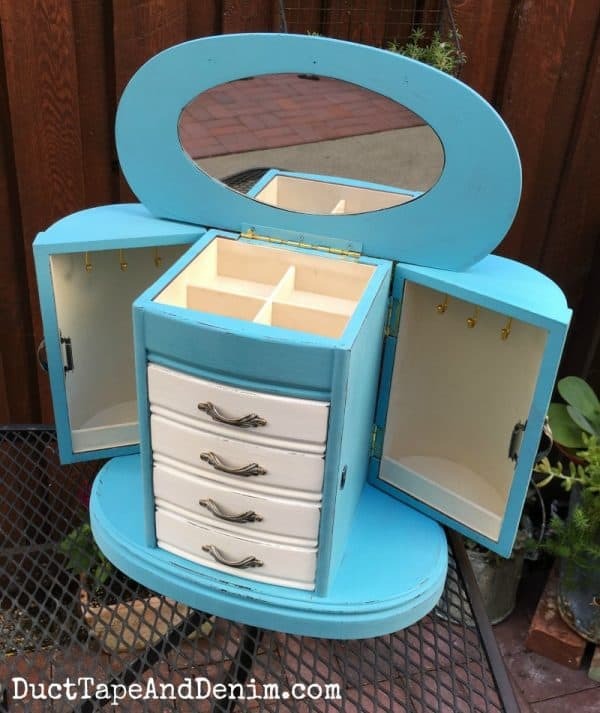 It look beautiful with the turquoise and the insides of the drawers are awesome. Ann….I always love your jewelry boxes….each one is so unique and so very pretty. Thanks for the inspiration. Super cute! Love the colors you chose! What a great makeover. The color is gorgeous and I love the sides! The color is beautiful, but what I really like is the paper detail on the sides of the drawers. It’s a lovely surprise. Thanks, Erlene! I love decorating the sides of drawers! I love the details, especially on the sides of the drawers. The jewerly box looks so updated with the colors you chose. Cool look. Thanks for sharing at To Grandma’s House We Go DIY, Crafts, Recipes and More Wednesday Link Party. I pinned this! Hope to have you join again next week! What a pretty makeover! 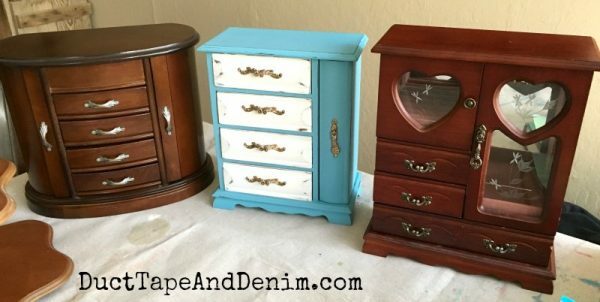 Love the color and how you did the sides of the drawers. Very pretty!